I have been happily experimenting away with carob recipes these past few weeks. These Peppermint Carob Pecan Cookies I’ve come up with are my very favorite carob recipe so far. Not sure what carob is? I wrote about it here. I used the Cool Mint Baking Buttons by Uncommon Carob that the folks at Azure Standard so graciously sent me for these taste treats. The peppermint flavor can go from subtle to in your face depending on how many of the baking buttons you use. This recipe also uses Einkorn flour, which is quickly becoming my favorite flour. But no worries, you can substitute regular ole flour if you don’t have any. So go grab your cutest apron and let’s get started! 1 cup will give you a subtle mint flavor, 2 cups is awesome! Start by preheating your oven to 300°F. In a large mixing bowl cream together the butter and both of the sugars until they are soft and fluffy. Now add the egg and beat that until it is well combined. Add the vanilla extract and the apple cider vinegar, and beat again for 2 minutes. 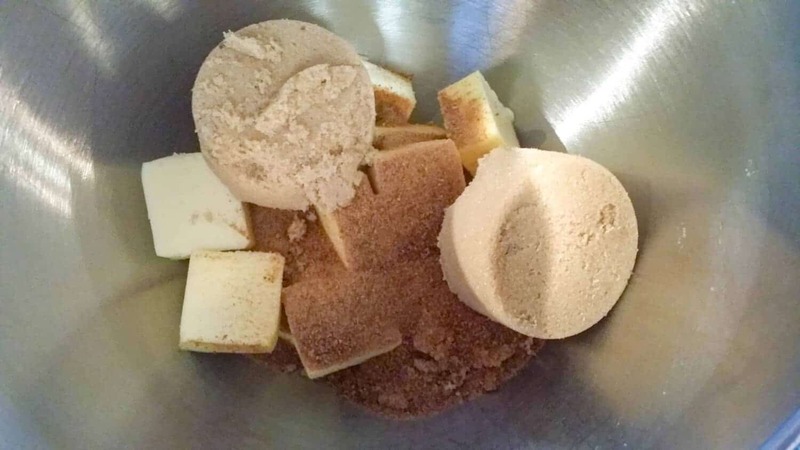 While that is beating, combine the einkorn flour, the salt, and the baking soda in a medium bowl and mix that all up really well. Add the flour mixture to the butter mixture a little at a time, beating well after each addition. And don’t forget to scrape down the sides of the bowl in between so all the flour gets mixed in. 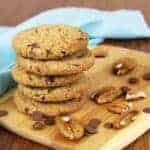 Finally, add those chopped pecans and the amazing baking buttons and mix briefly with a spoon or spatula. You can use the mixer, but you might break them up into little bitty pieces of you mix it for too long. Now, get your handy dandy cookie scoop (this one is my favorite), or 2 spoons and place the cookie dough in mounds on your baking trays about 2″ apart. Don’t squish it down, just leave it in a ball-ish shape. Now slide those heaps of heaven into the preheated oven. If you like crunchy, crispy cookies, bake those babies for 20-22 minutes. 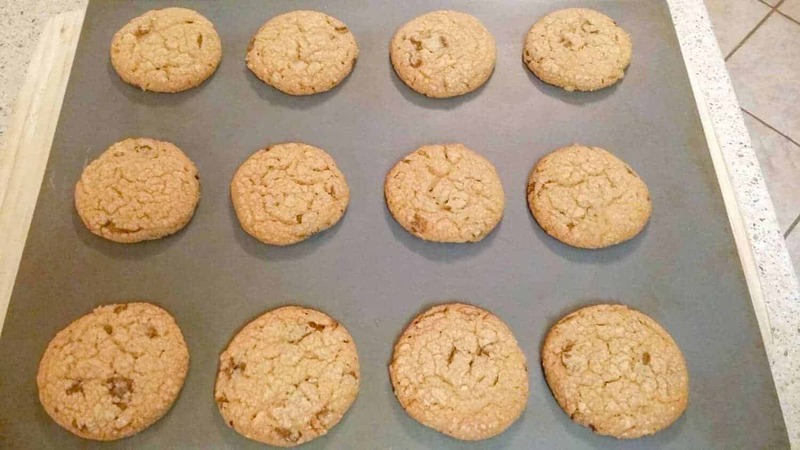 If you prefer your cookies on the chewy side like I do, bake for 15-17 minutes. As always, ovens vary so keep a close eye on that first batch so you don’t over bake ’em. The peppermint is going to seen a little extreme when you take them out of the oven, because some of the oils are baking off. So don’t worry if it smells really strong. Let those bad boys cool on a rack completely before putting them in an airtight container for storage…assuming there’s any left to store that is. 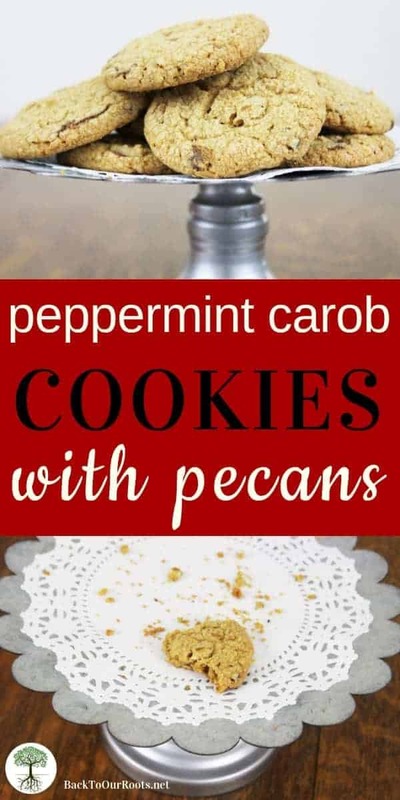 These Peppermint Carob Pecan Cookies are the perfect snack if you've given up chocolate. They have a subtle chocolaty taste and a burst of peppermint to liven things up. 1 - 2 c Cool Mint Carob Baking Buttons 1 cup will give you a subtle mint flavor, 2 cups is awesome! In a large mixing bowl cream the butter and sugars until soft and fluffy. Add the vanilla extract and ACV, and beat for 2 minutes. While that is beating, combine the einkorn flour, salt, and baking soda in a medium bowl and mix thoroughly. Add the flour mixture to the butter mixture a little at a time, beating well after each addition. Don't forget to scrape down the sides of the bowl. Finally, add the chopped pecans and the baking buttons and mix briefly. 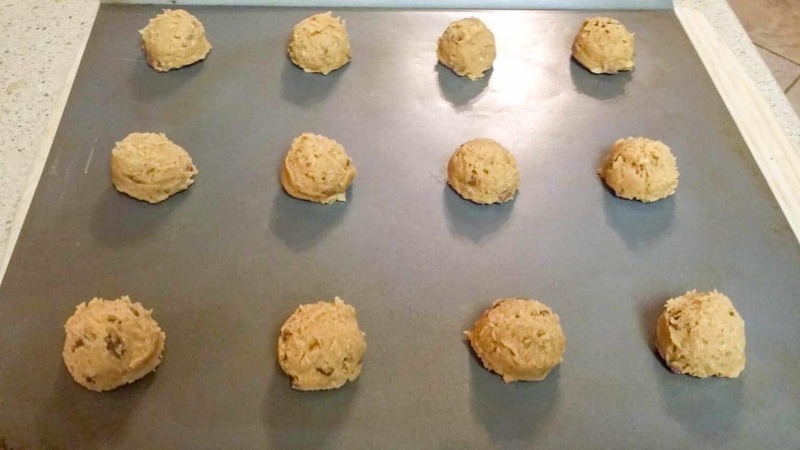 Using a cookie scoop or 2 spoons, place mounds of cookie dough on your baking trays about 2" apart. 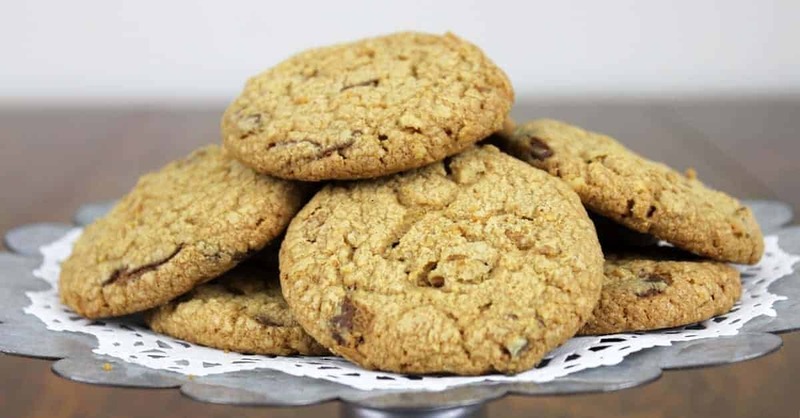 For crunchy, crispy cookies, bake for 20-22 minutes. 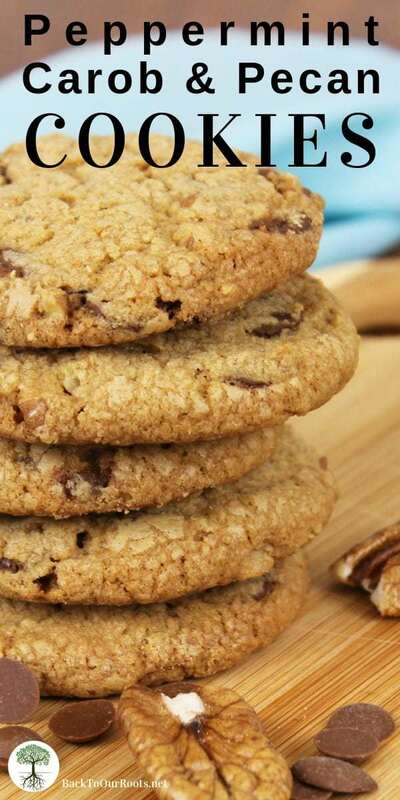 For chewier cookies, bake for 15-17 minutes. As always, ovens vary so keep a close eye on the first batch so you don't over bake them. The peppermint is going to seen a little extreme when you take them out of the oven, because some of the oils are baking off. So don't worry if it smells really strong.